I'm a fan of ostentatious footwear. The more attention-grabbing it is, the better! 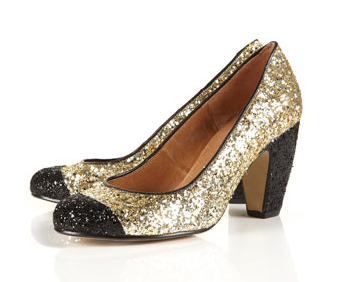 So all of these shoes, covered in gold glitter with black accents, are definitely at the top of my most-wanted list. I was inspired to find multiple black and gold glitter heels after finding the Miu Miu Glitter Peep-Toes ($675 at miumiu.com). I love the hint of black suede piping running the perimeter of gleaming, glittering gold. Read on for even more black and gold glitter heels. A delicate black ankle strap and applique bow anchor the bright gold glitter. Multiple black straps and a glittery gold back add up to glamorous fun. I've always loved Mary Janes, and this high-heeled pair is just so schoolgirl all grown up. These are actually a knockoff of an amazing pair of Miu Mius, but the price point is so totally right. From the woven straps to the super chunky gold platform heel, these exude Studio 54 cool. Sumptuous black suede is accented by the most divine strip of gold glitter and finished with a gold ankle strap. Delicious.